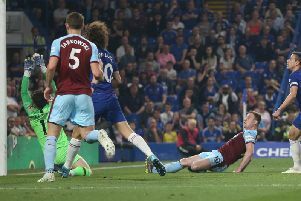 Joey Barton concedes that his goals won’t define his career but the midfielder is hoping that they’ll help to characterise Burnley’s season. The 33-year-old scored in successive games for the first time in 11 years when displaying exquisite technique and control to beat Brentford goalkeeper David Button with an unstoppable set-piece in the 3-1 triumph at Griffin Park. “It was nearly as good as Scott Arfield’s - I thought his goal was a cracker even though I didn’t actually see it,” he said. “I’ve had to watch it back because I was down off the ball. “Boydy and Jonah were trying to get the free-kick but I just felt it was a little bit too close. Barton added: “It was important to get that second goal and put your foot on the throat of the opposition. Then Boydy’s popped up with another really good finish. Barton, who netted his first goal for the club in the 5-0 thumping of MK Dons, hadn’t converted in back-to-back games since his Manchester City days in fixtures against Birmingham City and Wigan Athletic. “I thought it was the first time ever,” he said. “It’s not my primary function for the team but it is also nice to get on the scoresheet. “I’ve been unlucky; I hit the post against Forest, hit the bar against Bristol City so I was knocking on the door. Barton is now looking ahead to Monday when Derby County will be the visitors to Turf Moor (kick-off 7-45 p.m.). With just a solitary point separating the two sides, he said: “For us as a football club it’s very important that we show authority because we’re a very good football team and when you’ve got this collective and camaraderie as a group it was only a matter of time before we turned that in to performances. He added: “The key for me now is to build and carry this momentum on to the next game. We’ll go out and try to win the next game and it’s a massive game in the context of the league against Derby at home. “We’re fully focussed on getting a positive result at Turf Moor under the lights.